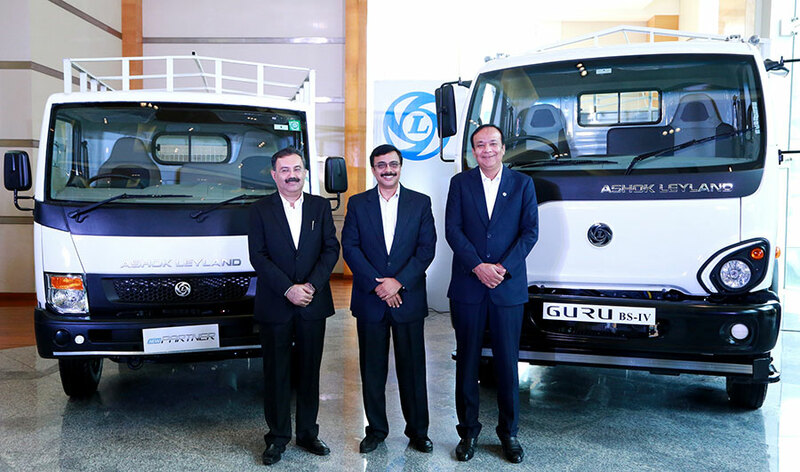 Ashok Leyland, flagship of the Hinduja Group, and one of the largest commercial vehicle manufacturers in India, launched the ‘GURU’– the latest Intermediate Commercial Vehicle (ICV) and the ‘PARTNER’ – the new Light Commercial Vehicle (LCV) in Chennai today. ‘GURU’ offers an ideal combination of best-in-class fuel efficiency and highest actual payload, ensuring maximum returns for its owners. After the commercially successful ‘DOST’, ‘PARTNER’ is India’s first air-conditioned LCV goods vehicle with best-in-class comfort from Ashok Leyland. ‘GURU’ has been launched in the price range of INR 14.35 lakhs to 16.72 lakhs including VAT and the PARTNER 6-tyre, 14 ft HSD BS IV is priced at INR 10.59 lakhs and PARTNER 4-tyre, 14 ft HSD BS IV is priced at INR 10.29 lakhs. Prices are ex – Showroom, Chennai. Ashok Leyland has upped the ante over the last few years and that reflects in our results. An integral part of this performance is our winning product portfolio which delivers superior returns for our customers and we believe this is the reason we are growing our market share across markets. Two indispensable products in this strategy are the ‘GURU’ and the Next Generation ‘PARTNER’, our latest offering in the ICV and the LCV segment, respectively. With these launches, we have further strengthened our position in the market and are closer to our vision of emerging as one of the top 10 truck makers, globally, by significantly increasing the market share in ICV and LCV segments. Ashok Leyland has always focused on delivering the right product to its customers and ‘GURU’ is our latest offering. ICV is one of our key focus areas to achieve our vision in trucks and with the ‘GURU’, Ashok Leyland will further increase its market share in the Competitive ICV segment. ‘GURU’ helps customers increase their revenue stream by having the best payload and ensures maximum uptime, thanks to robust and reliable aggregates. Launched at a competitive price point, ‘GURU’’s best-in-class fuel efficiency, combined with longer tyre life, will help reduce operating costs for customers. Reinforcing our brand promise of ‘Aapki Jeet, Hamari Jeet’, ‘GURU’ will help our customers maximise profits by increasing revenue and reducing operating costs. We are delighted to present this LCV from the Ashok Leyland, the ‘PARTNER’ –the Indian industry’s first truck in its segment with an Air Conditioned (AC) cabin and equipped with a BS-IV engine. With the launch of ‘PARTNER’, we have stayed true to our LCV mission – to deliver to the Indian customer, contemporary products that deliver best-in-class user experience, coupled with exceptional efficiency. This is an exciting addition to our LCV portfolio and we are confident that we will delight the customers and continue the successful winning streak with ‘PARTNER’, like that of the ‘DOST’.